Title: Here comes the DPU! Description: SB Welch TX coal loads get a recrew at the yard office in DeQueen. Description: With a fresh crew onboard, TXUX coal loads cross the DQ&E diamond and head south. Description: Rear helper of a coal train on the unloading track for the power plant near the KCS yard. 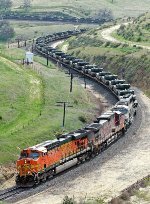 Description: BNSF train U-PADHLG1-01, with a solid train of DODX flats with M1 Abrams tanks, threads it way through the curves between Bealville and Tunnel 2 as it descends the Tehachapi Mountains. On the head-end are ES44DC 7721, Dash 9-44CW 655 and SD70MAC 9672. Description: BNSF train U-PADHLG1-01 (Unit Train; Paducah KY to Herlong CA), with a solid train of DODX flats with M1 Abrams tanks, has just exited Tunnel 2 as it descends the Tehachapi Mountains and heads toward Caliente and then Bakersfield. On the head-end are ES44DC 7721, Dash 9-44CW 655 and SD70MAC 9672. Description: A Columbia bound coal load has a fresh crew and heads for the Bluff, where this will be handed off to the CP. Description: An SD60M painted up in the H2 scheme is seen stored at the diesel shops. The SD40-2s behind the 8158 it is the 8029, and the 6380 is coupled to the front of the 8158. Description: BNSF 9672 idles away with other units as the hump tower watches over the yard and diesel shops. Description: Thanks to a stalled coal train earlier in the morning, trains were stacked up between Littleton and Palmer Lake. They even ran a Southbound on Main 2 which doesn't happen often. Here two Creme and Greens posed and I shot out the window while driving down the highway. Title: BNSF 9672 Sitting at the 51. Description: Empty ore train waits for a SB to get close before heading into the siding at Old Monroe Mo. Description: Not sure the location that this originated from, but was a very short train, looking like a local.